The sun is shining today, and I should be outside washing my very dirty windows! Instead, I find myself attaching camera to desktop to share Strawberry Blueberry Cheesecake pictures with you. 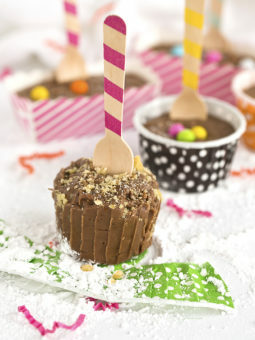 Fathers Day is quickly arising & this dessert will be a winner, at any bbq or fancy table. It will be interesting to see if my guy wants this delectable number or Angel Food cake with raspberries & Whipped Cream. I bet it’ll be a toss up! The crust isn’t your typical graham cracker crust, and the cheesecake mixture isn’t your typical cool whip center. It’s really yummy, and it holds up very well in the refrigerator. You could make this the day before your get-to-gether, and not worry about a soggy crust. In fact, I love this Danish Berry topping, because you don’t have to cover it tightly. It sets ups perfectly every everytime. I added fresh strawberries & blueberries to the Danish Dessert, but you could add raspberries, blackberries, huckleberries as well. If you don’t want to use the Danish dessert on top ( but it’s soooo good) you can use pie filling instead. The recipe for the crust makes a large 9×13 pan of dessert, but I wanted to share, with a very good friend who moved from the neighborhood. That was a not a very nice thing to do my friend!!! I made 2 small pans instead on one great big one. 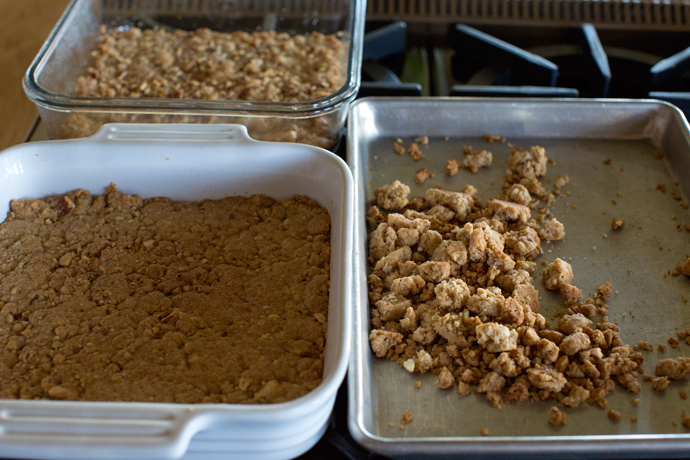 Pat 2/3 of the crust mixture into your baking dish or dishes, and save 1/3 of the crust for a crumble topping. Just press the mixture together tightly in the fist of your hand. Let large chunks fall away onto your cookie sheet. Bake along side the other crust in the oven until nice & golden brown. Set aside to cool. Note: In the clear baking dish at the back of picture, I pressed a lot of extra nuts into the crust mixture. That’s A ok! I wasn’t sure if my sweet friend would love that many nuts, but my sweet husband loves as many as I’ll give him! Chopped almonds, walnuts, pistachios, hazelnuts, cashews are all really good. I used a mixture of almonds & walnuts. While the crust cools, prepare the danish dessert. Let it cool slightly, then add your sliced strawberries. Toss in a few blueberries as well. I added about 1 cup of each. Let this mixture cool completely. Don’t put it in the fridge though. Just let it sit in the pan. Beat the (room temperature) cream cheese until it’s super duper creamy & fluffy. Make sure you don’t have any lumps. 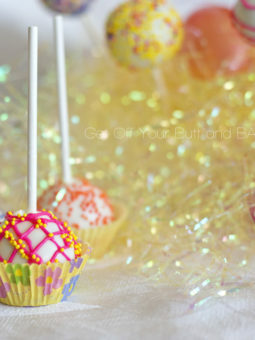 Slowly blend in the 1 cup of powdered sugar and keep blending until it very fluffy. Add a dash of vanilla, and beat again. Set this mixture aside. Take 1 pint of whipping cream from your fridge. That is 2 cups of cream. Pour the cream into a deep bowl and whip the cream until you have firm peaks. Now add the cream cheese mixture to the whipped cream, and slowly start to fold the two mixtures together with your spatula. JUST FOLD. You will have this beautiful, billowy, delicious, cream cheese mixture. Spread the mixture into your 9×13 baking dish over the top of the cooled crust, or divide it between your two pans . . . like I did. Now top with the beautiful berry mixture. My Mom used to make junket Danish Dessert as a pudding, and top it with whipped cream. It’s soooo good. 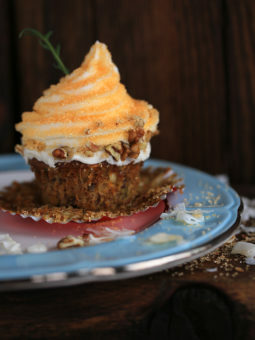 When serving, sprinkle your reserved crumb topping over the top, and add few extra nuts if desired. Take pretty pictures if you like. Stand back and watch said husband laugh, as you try to find the perfect spot to take your pictures. On a side note . . .This could also be pretty for the 4th of July! 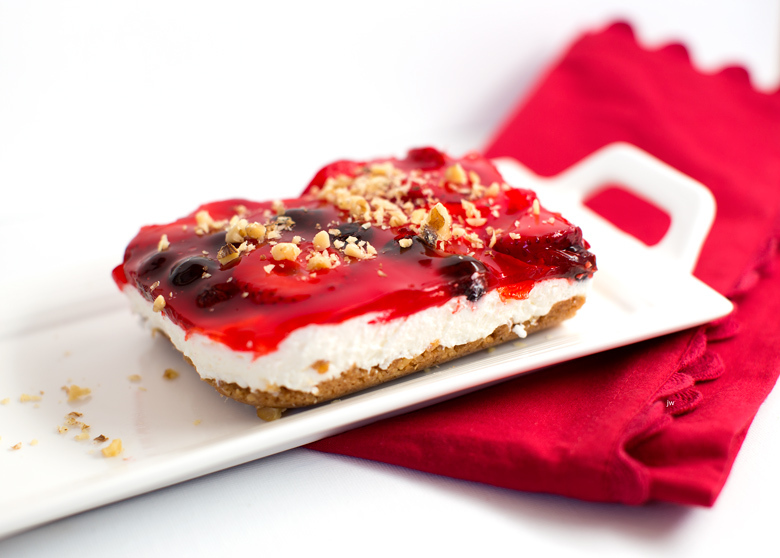 This No Bake Cheesecake can easily be made the day before an event. Don’t cover it tightly, and the crust will stay crunchy. It’s delicious! Combine room temperature butter, flour, brown sugar and nuts in medium size bowl and using a fork, combine together. Do not over mix. Bake crust in pre-heated 350 degree oven for about 20 minutes or until golden brown. Remove from the oven and let cool completely before adding the cream cheese & berry mixtures. Whip softened Cream Cheese until light & fluffy. Make sure that you don’t have any lumps remaining. Slowly add 1 cup powdered sugar and continue beating until it’s very creamy. Add 1/2 teaspoon vanilla and beat again. Beat one pint whipping cream (2 cups) until stiff peaks form. Fold the cream cheese mixture into the whipped cream until blended together. Mix 1 package danish dessert with 1 3/4 cups water in saucepan over medium heat. Stirring constantly, bring this mixture to a boil. Continue to boil for one full minute. Don’t quit stirring! Take the mixture off the heat and let cool just slightly. Add the sliced strawberries, blueberries and let cool completely IN THE SAUCEPAN. Spread Cream Cheese cheese mixture over the cooled crust. Spread Berry mixture over the cream cheese layer. Refrigerated uncovered for 3 to 4 hours. Before serving, top with reserved cookie crumbles and additional chopped nuts if desired. This dessert keeps well in the refrigerator. Cover very loosely, or not at all. 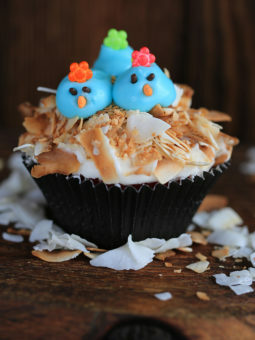 This is something I MUST make! But is 2 cubes, 2 sticks? I think that is what you mean but I just want to make sure so I don’t screw up the ingredients? That would be a catastrophe! Some of my handwritten recipes refer to sticks of butter as cubes! Well . . . that name certainly fit! I think I should use that from here on out. 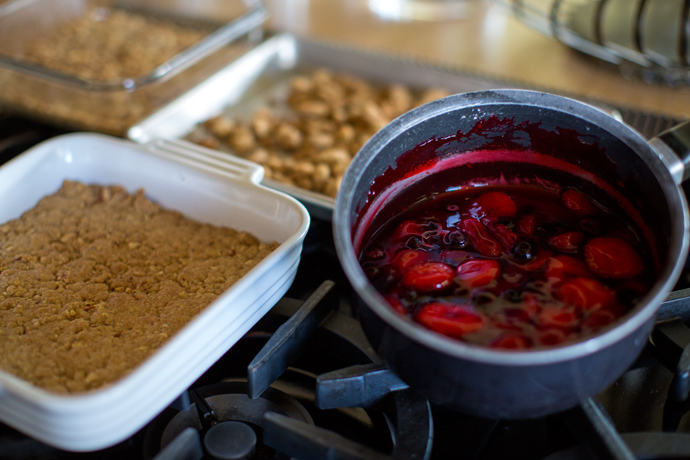 Yes, instead of using the Danish dessert and berry mixture, just use pie filling instead. It’s not quite as thick but it still works great.